Galileo offers four large format sytems for researchers requireing longer run lengths and increased sample capacity. All Galileo large format units use the ExpressCast gel casting system for quick, tape-free gel casting. These units offer high sample capacity with short to long run lengths. The 2340 unit includes built-in buffer ports for attachment to a buffer cooling and recirculation systems. All other units can be ordered with buffer ports as an option. In addition, the 2325 unit now can be ordered with built-in automatic buffer recirculation systems, that require no additional attachments. See the link for more information on the new Galileo auto-recirc systems. 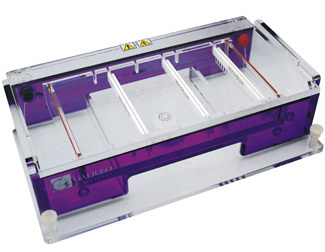 These Galileo gel units all feature the ExpressCast™ system for quick, tape-free gel casting. Standard flush-cut trays are also available for all units. Click the link for more information on Galileo casting systems.